Group Discussion Ideas > Political GD Topics > ‘One Nation One Election’ – Feasible? ‘One Nation One Election’ – Feasible? Elections are the most fundamental requirement to operationalize the democracy, so the way it should be conducted holds the utmost importance. Elections are the means to serve people but it should not become the most important factor in the democracy. Every year one or the other state is geared up for an election in India. This process of campaigning is often very tiring and the cost incurred is also very high. 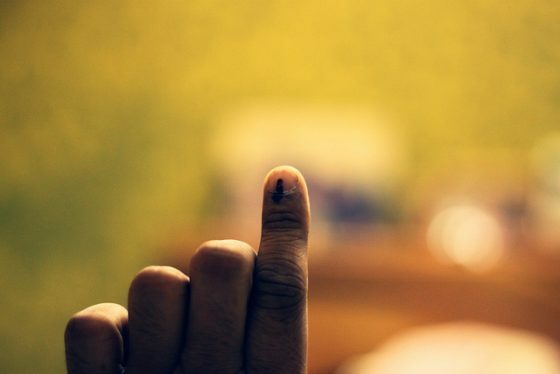 Simultaneous election means a single voter will vote for both Lok Sabha elections as well as State Assembly elections on the same day, and elections can be conducted in phase wise manner in all the states. State and union elections are to be held after a term of 5 years, but the constitution is silent as to whether this is to be done simultaneously or not. If elections are conducted simultaneously, politicians will focus more on long-term development. When elections take place, a Model code of conduct is applied, during which a reigning government cannot launch any new schemes or make any transfers or appointments. With simultaneous elections, the time for the model code will also get reduced. Hence, a simultaneous election reduces policy paralysis. Less disruption to public life, less road traffic and less loss to our economy. As all the government staff can be used at a single time, we can also increase vigilance, and factors like black money, booth capturing, etc. can be reduced. PM or CM or any head ministers will be focused on governance for the majority of their span. Politicians will also focus on local issues, which as a result will be good for micro-governance. It will also lighten the financial and administrative burden on EC. The same system is used in several other countries, even in Britain, from where we have occupied the majority of our constitutional structure. Simultaneous Elections used to happen in the nation before 1972, but due to some reasons it couldn’t be continued which compelled the EC to conduct both center and state elections separately but there can be another method where a no-confidence motion is followed by a confidence motion in another member of the ruling party. To conduct simultaneous elections in India we will have to make many amendments to the constitution of India. Frequent elections in the country will bring politicians back to public frequently whereas cutting down on elections would mean making them lazy for the rest of the term and suddenly becoming overactive during the election year. Majority of voters of our country are unaware about the mechanisms of the polity, so they may get confused. What if any party losses power in midterm or any minister or representative dies, as a result, the seat goes vacant by any mean then we have to re-conduct the elections which could be conducted easily with the current system but will be difficult in simultaneous elections. Therefore, a system of continuous by-elections will have to persist with the simultaneous elections system. When state elections are conducted along with the center the regional parties may get marginalized because of the same party getting majority in the center may get votes in the state as well. Holding both the elections together will also mean mixing up the national issues with those of the state. The national issues would overpower the state which in turn would get less priority from the politicians. The period prior to 1972 was a period of single-party dominance. The scenario now is different from then, Several nations have also experimented with the idea and ignored it later. Furthermore, India has a large array of regional parties which have a strong impact there. One India One Election would be a good change if it could be carried out with the proper execution of policies and rules, taking care of the rising need for good administrative staff and security. The standing committee has said that solutions should be found to reduce the frequency of elections India so that government machinery, as well as election commission, can get some time for other administrative works. Afterwords :- What is your opinion on this topic? Express your thoughts in the comment section below. Subscribe to our blog to get new topics delivered to your mail. Photo Credits: Yogesh Mhatre via Flickr under CC 2.0. We have to involve maximum youth in democratic practices.No eligible citizen to be left out in enrollment. First time voters should be given proper awareness.